We deliver integrated controlsystems. 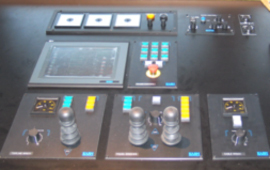 These include control of the winches , cranes and powerpack. We deliver auto trawl system. KARM 4010. KARM TRAWL 4010 presents the skipper with all necessary information during trawling. This information increase the safety when trawling and make it possible to control the trawl in all situations. The systems is continuously under development . The system can be delivered with open access for pairtrawling or from onshore.